Kia’s often-overlooked Rondo model takes up about the same parking space as a 2009 Kia Optima but is much roomier inside and doesn't cost much more. For all practical purposes, it serves as the wagon variant of the Optima. The 2009 Kia Optima is a thoroughly competent, comfortable mid-size sedan that’s sorely lacking in personality and excitement—even with a modest spice-up for this year. 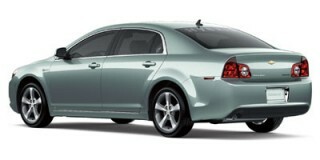 The experts at TheCarConnection.com consulted a number of professional review sources in compiling this extensive review on the 2009 Kia Optima. 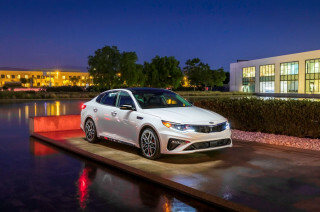 TheCarConnection.com's editors have driven the Optima and bring their experience to this review. The 2009 Kia Optima is the Korean automaker's mid-size sedan. Although the Optima continues, as in previous model years, to favor comfort and frugality over style and trend-setting options, the Optima has been made a little more appealing for 2009 with a styling makeover and new engine options. Both of the Kia Optima's engines receive power boosts for 2009, with the four-cylinder now producing 175 horsepower and the six-cylinder offering 194 hp. Five-speed transmissions are the norm on the front-wheel-drive Kia Optima lineup, with a manual coming standard on the four-cylinder and an automatic option; the V-6 comes exclusively with a five-speed automatic. With the automatic transmission, there's not really much of a difference in performance between the two models, except the four-cylinder engine can coarsen under hard acceleration. At 22 mpg city, 32 mpg highway, its fuel economy is also slightly better than with the V-6. 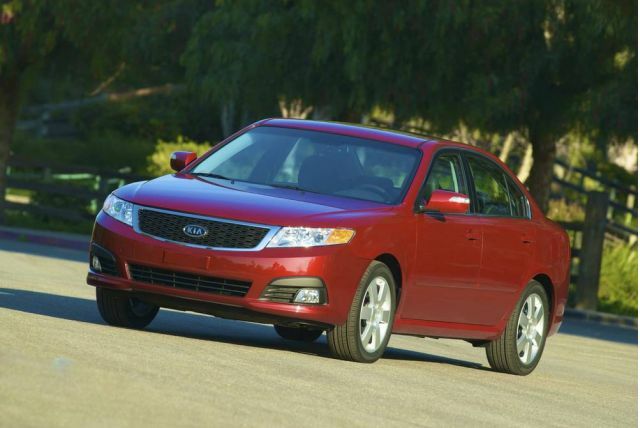 The 2009 Kia Optima boasts a relatively pleasant ride, although running over larger bumps can be jarring. The Optima is clearly more comfortable on city streets than rural roads, where its crisp, responsive steering feel shines through, but it can't maintain its poise when navigating curvy back roads. Last year's Kia Optima featured one of the roomiest cabins in its segment, and the addition of 3 more inches to the overall length for 2009 only helps in that regard. The Optima boasts good backseat legroom and headroom, and the big 14.8-cubic-foot trunk will swallow more gear than most of the Optima's competitors. The base Kia Optima LX features standard cruise control, keyless entry and alarm, a manual tilt and telescopic steering column, radio controls on the steering wheel, and floor mats. The Optima LX, meanwhile, adds dual exhaust outlets and alloy wheels when equipped with the V-6. Moving up to the mid-range Optima EX, expect to find alloy wheels, fog lights, solar glass, an eight-way power-adjustable driver's seat, automatic temperature control, an auto-dimming rearview mirror with HomeLink, and a leather-wrapped steering wheel. The Kia Optima EX also comes standard with an Infinity AM/FM/six-disc CD/MP3 premium audio system, and the V-6 gets dual exhaust outlets. The top-of-the-line Kia Optima SX picks up black leather, aluminum trim, and metal pedals. The 2009 Kia Optima has top five-star results from the federal government in both frontal and side impact tests, along with a "good" rating in frontal impact and an "acceptable" rating in side impact from the insurance-affiliated IIHS. Standard safety equipment includes front and front seat-mounted side airbags, full-length side curtain airbags, and active front headrests. Anti-lock brakes and electronic stability control are available together as a packaged option on all but the base model. Despite Kia's best efforts to bring some style to the 2009 Kia Optima, the sedan is still as bland as ever. The Kia Optima lineup gets a makeover for 2009, but reviews read by TheCarConnection.com reveal that this mid-size sedan is still a styling disappointment. 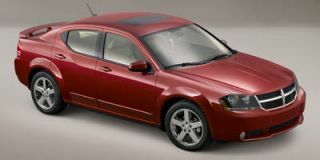 The Kia Optima last underwent a major redesign in 2006, but in response to broad criticism of the Optima's style, Kia unleashed a mid-cycle update in the form of the 2009 Kia Optima. Unfortunately, the new looks have done little to increase the Kia Optima's visual appeal. Edmunds contends that the 2009 Kia Optima's "styling allows it to blend seamlessly into any automotive crowd," and Cars.com reports that the "new face seems derivative of a lot of other cars—the headlights look like a Toyota Camry's, while the interplay between the grille and lights recalls a similar pattern on the new Honda Accord." Autoblog reviewers are particularly blunt, claiming that although "all the sheetmetal is new, the '09 Optima still looks as interesting as white bread." Jalopnik does appreciate the upgrades, however, noting that the 2009 Kia Optima is "a definite improvement over the 'only as a rental car' original design." For those who don't value styling as much as the Kia Optima's more redeeming qualities and are still interested in buying one, Cars.com says "trim levels include the base LX, uplevel EX and sporty SX." Although you can't always judge a book by its cover, you can judge the Kia Optima's cabin styling by its exterior sheetmetal. Edmunds says that the interior is "hardly a vibrant environment." Cars.com, meanwhile, informs that "Kia didn't alter the [Kia] Optima's interior as much as it did the exterior; the most notable change is probably the gauges, now framed inside three binnacles instead of a one-piece display." One surprising review of the Kia Optima's interior comes from Cars.com, where some reviewers make the following observation: "A relentlessly detailed and fastidiously executed interior that shames pricier cars here? Watch out, Kia has caught Toyota (and others) napping." 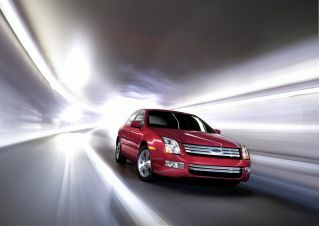 The 2009 Kia Optima is a capable commuter, as long as you don't mind that fuel economy lags behind most competitors. Through the wonders of modern automotive technology, Kia has endowed both of the 2009 Kia Optima's engines with more power yet managed to keep fuel economy at about the same levels as last year's model. Sadly, the extra power isn't enough to make the Kia Optima even remotely exciting to drive. According to Cars.com, the 2009 Kia Optima is available with a standard "2.4-liter four-cylinder [that] makes 175 horsepower, up from 162 hp last year," while the available "2.7-liter V-6 is up to 190 hp from 185 hp last year." Though the power boost is welcome, Autoblog says the Kia Optima is "still underpowered in our book compared to other mid-sizers that have been offering 3.5L+ V6 engines producing 250 horsepower for some time." Reviews read by TheCarConnection.com are hardly enthusiastic about the performance of either engine. Car and Driver reports that the 2009 Kia Optima has "Joe Average performance," and ConsumerGuide warns that the Kia Optima "strains to provide highway passing power." 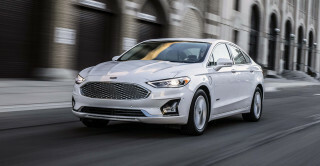 Overall, Edmunds advises that consumers "stick with the base four-cylinder engine, as it provides fully adequate performance while keeping the price tag and fuel consumption low." The 2009 Kia Optima is available with a choice of two transmissions, and Cars.com notes that the automatic “has a manual-shift mode." Both transmissions are available with the four-cylinder engine, although the V-6 is mated exclusively to the five-speed automatic. Like the rest of the 2009 Kia Optima, nothing about the transmissions stands out as being much better than average. ConsumerGuide finds that "with either engine, the automatic transmission's upshifts are occasionally lazy and downshifts can be tardy." On the positive side, Edmunds remarks that while the Optima's "five-speed automatic is reluctant to downshift...there is a manual mode when you want some extra punch." For an adequately powered mid-size sedan, the 2009 Kia Optima doesn't exactly excel in the fuel economy department. According to the official EPA estimates, the 2009 Kia Optima four-cylinder will get 22 mpg city and 32 mpg highway with either transmission, while the V-6 returns ratings of 20 mpg city and 28 mpg highway. Unlike the styling and engine output, little has changed for the 2009 Kia Optima regarding ride quality and handling. Overall, the ride is pleasant, although larger bumps can unsettle the Kia Optima. Car and Driver appreciates the Kia Optima's "good road manners," but warns that the Optima's "sporting pretensions [are] still only pretensions...there is nothing in its persona to tempt enthusiasts." ConsumerGuide also claims that though the Kia Optima is "no sports sedan...it is a bit more athletic than the similar Hyundai Sonata." Kelley Blue Book adds that the Kia Optima's "body roll is minimal and the Optima enjoys a balanced feel." Edmunds reviewers sum up the Optima rather nicely, commenting it is "no hot rod, though its responsive suspension and steering make it reasonably fun to drive around town," but "driven aggressively on back roads, the Optima loses that sporting disposition." The 2009 Kia Optima excels in terms of materials and utility but loses points for its noisy, unrefined engines. The addition of three inches to the 2009 Kia Optima's overall length brings it more in line with the mid-size sedan segment and adds to its already impressive interior room. The Kia Optima offers seating for five within its comfortable interior, which is highlighted by a pair of well-executed front seats. Car and Driver says that "posteriors in front sink into buckets with a cushy top layer akin to a pillow-top mattress," although they add that "side support is wanting." ConsumerGuide agrees, finding that the seats "offer little lateral support in turns," but there is "sufficient legroom and adequate headroom for tall drivers" in the twin bucket seats up front. The backseat isn't quite up to par with the front seats, but it's far from the worst in the mid-size segment, based on reviews read by TheCarConnection.com. ConsumerGuide points out that "knee space grows tight if the front seats are far back," while taller passengers will be disappointed to learn that the "mediocre headroom is diminished further by the sunroof housing." Edmunds simply states that, while the "Kia Optima's cabin is spacious," the rear "seat bottoms are a little short, offering less support for long-limbed occupants than many rivals' accommodations." The practical 2009 Kia Optima excels in terms of storage space, both inside the cabin and the trunk. ConsumerGuide finds that the Kia Optima offers a "decent-size trunk [that] has hinges that don't intrude into cargo space," while Edmunds says that "trunk capacity is 14.8 cubic feet, and all Kia Optimas have a 60/40-split-folding rear seat." Moving inside the 2009 Kia Optima, ConsumerGuide notes "sufficient cabin storage with an ample glovebox, door map pockets, and an armrest console." Interior materials are a pleasant surprise on the Kia Optima, with many reviewers raving about the quality of the pieces. Edmunds says that the 2009 Kia Optima's "interior materials as a whole give an impression of quality," while Cars.com mentions that the Kia Optima SX gets "electroluminescent gauges, custom leather seats and metallic trim." Kelley Blue Book also reports that "even in base LX form, the Optima's interior materials rate well above merely acceptable," and on "those cars with leather we were impressed by the leather's tone and its perforated texture." While materials are a definite plus for the 2009 Kia Optima, noise levels are once again more in line with the class average. 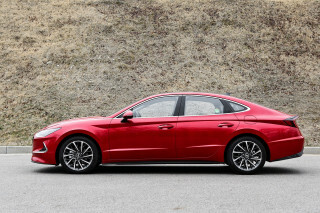 Although Car and Driver claims that the "2.4-liter GEMA engine...mostly hums quietly to itself and winds to high revs without major vibes," ConsumerGuide feels that the Optima's "four-cylinder emits a thrashy groan at full throttle...the V-6 is noticeably quieter but is less refined than most rivals V-6s." The 2009 Kia Optima has reassuring crash-test scores, but safety-concerned shoppers will have to check some option boxes. The 2009 Kia Optima earns some of the best safety ratings of any vehicle on the road, but TheCarConnection.com's research reveals a few flaws with the Kia Optima's safety features. When it comes to crash-test ratings, you won't find many better than the 2009 Kia Optima's. NHTSA awards the Kia Optima perfect five-star ratings in both the front impact and side impact categories, while the Optima also scores four stars for rollover resistance. The IIHS results are comforting as well, with the Kia Optima garnering the highest possible rating of "good" for the frontal offset impact test and a second-best rating of "acceptable" for side impacts. Edmunds reviewers note that these are "excellent crash scores" from both agencies and should boost the Kia Optima's standing with the safety-conscious. The refreshed Kia Optima offers a mixed bag of safety features. 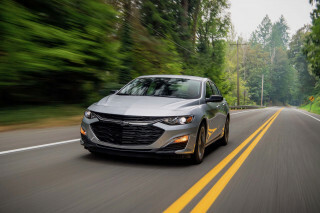 On the positive side, ConsumerGuide points out that "available safety features include ABS, traction control, antiskid system, front side airbags, and curtain side airbags." 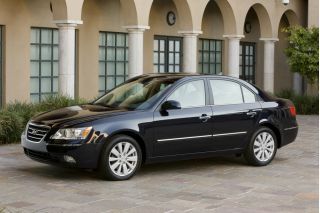 Cars.com adds that "active head restraints" are standard, but "unfortunately, antilock brakes, an electronic stability system and traction control are grouped together in an option package; the Accord and Sonata include those features standard." In terms of driver visibility, which is one oft-overlooked element of overall safety, the 2009 Kia Optima offers a better-than-average view. Kelley Blue Book feels that the 2009 Kia Optima provides a "nice balance between outward visibility and efficient aerodynamics," while ConsumerGuide reports that "visibility is fine in all directions." A new navigation system for the 2009 Kia Optima rounds out what was already an impressive list of optional features for the Optima lineup. It's surprising what you can get for a relatively low base price these days, and in this world of surprises, the 2009 Kia Optima offers some big ones. The 2009 Kia Optima is available in three trims: LX, EX, and new-for-2009 SX, with minor visual differences between the three. According to Cars.com, "sixteen-inch steel wheels come on the four-cylinder Optima LX, while other trims have 16-inch alloys" and the Kia Optima "SX has 17-inchers." Otherwise, the trims are nearly identical. Reviews read by TheCarConnection.com report an impressive number of standard features inside the 2009 Kia Optima. Car and Driver finds that the 2009 Kia Optima delivers "high standard-feature content [and] lots of standard features," as Cars.com adds that "air conditioning, power windows and locks, heated mirrors and a six-speaker CD stereo are standard." While the LX comes with standard cloth seats, ConsumerGuide notes that "leather upholstery is standard" on the EX, and Cars.com states that "SX trims have electroluminescent gauges, custom leather seats and metallic trim." Kia Optima V-6 versions come with dual exhaust outlets, while J.D. Power reports that "a new audio system in the 2009 Kia Optima is MP3 compatible and Sirius satellite radio capable, and features a USB port and an auxiliary jack." For those who crave customization for their 2009 Kia Optima, the optional features list won't disappoint. J.D. Power says that "an optional navigation system is a first" for the Kia Optima, while ConsumerGuide lists "heated seats, sunroof, and power-adjustable pedals" among the other options. Kelley Blue Book calls the 2009 Kia Optima "well-equipped...above the basic transportation category," and Autoblog reviewers note that you have "way more ways to plug into your consumer electronics (USB, MP3 player plug, etc.)" with the new 2009 Kia Optima. The one major feature lacking from the 2009 Kia Optima is a Bluetooth connection for your cell phone.